1) Don’t smoke – batteries produce gases that are explosive. 2) Remove loose clothing, jewelry, watches, and necklaces as they might get caught in moving parts. 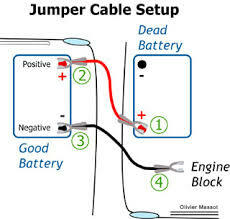 3) Do NOT attach the negative jumper cable to the negative post on the dead battery. The sparks given off could ignite the battery gasses and cause an explosion. Have your Playa West Automotive mechanic check your vehicle if you are having Starting problems.